Soak the basmati rice in water for 30 minutes.In a pot put few teaspoons of oil, add the cloves, cardamom, black pepper, cinnamon stick and bay leaves. Fry for few seconds then add the green chillie and onion and cook till the onion becomes soft. Now add the ginger garlic paste. After a minute add the tomato and cook till they become nice and soft.Add the chopped mint, cilantro and cook for couple of minutes. 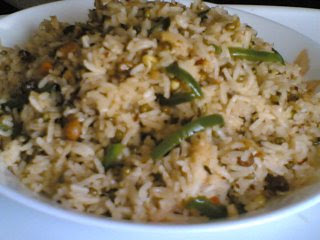 Now add the rice and cook for five minutes, so that the rice can absorb the flavors of all the spices. Then add the coconut milk with water and salt and let it come to a boil.At this point you can finish cooking the pulav in the same pan or you can transfer the whole thing to a rice cooker and finish the cooking in there.We finished our pulav in a rice cooker. I prefer it this way, I just feel this way I don’t have to keep an eye on pulav while cooking. I put my potatoes in a corning bowl, cover it with a plate and cook it in microwave till its half done. It took about four minutes for my potatoes to be half way done in the microwave. I generally do this because it significantly reduces the cooking time. Then peel them and cut to small pieces. Now take a pot add few teaspoons of oil, bay leaves, cinnamon stick, cloves, cardamom and black pepper. 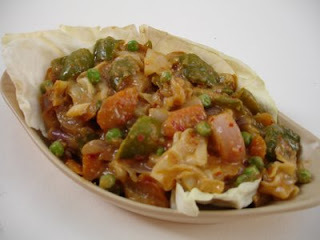 Fry for few seconds then add the green chili, onion and cook till the onion becomes soft. Now add the ginger garlic paste. After a minute add the tomato and cook till they become nice and soft. Now add the potato with garam masala and salt. Cook till the potato becomes soft and the whole mixture becomes little thick. This takes about ten minutes, at this point stir in the yogurt (wisk it before adding) with coriander leaves. Let it simmer for another five minutes and turn the stove off. Taste and re-season accordingly. Cook chana dal with one cup of water in the pressure cooker. Make sure the dal still holds its shape, so its very important not to over cook it. In a small vessel put the sabudan with one cup of water and cook in low heat for about seven minutes or until the sabudan is cooked through. Keep it on side.In a mixer grind the cashew and coconut with half cup of milk.In a small pan add the ghee and fry the cashew and raisins till golden brown.Now take a vessel, add one cup of water with the jaggery and boil till the jaggery melts. Then add the cooked sabudan, mix and add the cashew-coconut paste with 3 cups of milk. Cook all these in medium heat for about ten minutes.At this point add the cooked chana dal (with the water) and boil the whole thing in low heat for another ten minutes. At the end add the cardamom powder and fried cashew and raisins.Let it sit for few minutes, offer as naivedyam to the god and enjoy this payasam with your loved once. Lightly toast the yellow moong dal, now mix it with rice add the milk and pressure cook. (Make sure the rice and moong dal is just cooked through, but not very mushy). Now take a big skillet, add two cups of water and jaggery powder. Let the jaggery melt and water come to a boil. Once that’s done, add the cooked rice and dal mixture. Mix it well and cook for about five minutes.In a different skillet heat 3 tsps of ghee, add cashews and raisins and fry till light golden brown. Once the pongal comes together add the cardamom powder and the fried cashews and raisins and turn off the stove. Offer the sweet pongal to the God as naivedyam( offering) and enjoy this simple yet delicious sweet as prasadam with your loved once. In a pan add one tsp oil then add one garlic clove, cumin and dry red chillies. Slightly toast them. 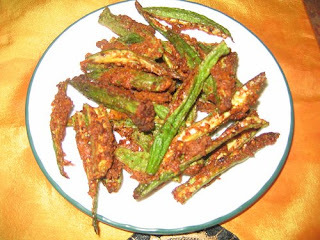 Remove mix the above ingredients with the dry coconut, dalia and grind.Cut the bell pepper in to small chunks. In a pan do the tadka first ( 3 tsps oil, few mustard seeds, 1/2 tsp chana dal, 1/4 tsp cumin seeds and a pinch of hing).Now add the remaining one clove of garlic(finely chopped)with the bell pepper. Add half a teaspoon of salt and cook till the pepper becomes soft.It takes about ten minutes for the peppers to cook. Now add the spice powder, lemon juice and cilantro. Taste and reseason accordingly. 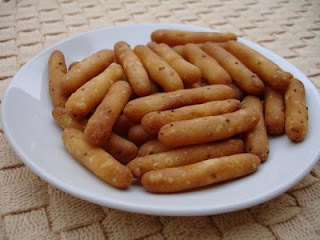 Enjoy with chapathi or hot rice. 2. Any kind of veggies you like- I used beans, carrot and broccoli. In a pot boil lots of water, add salt and add the pasta to it. Cook the pasta, till its about eighty percent done. Don’t cook completely, because we will be finishing the cooking in the oven. Now take an oven safe pot, add the pasta, olive oil, garlic cloves (finely chopped), crushed red pepper, veggies and the marinara sauce. Toss it, till the pasta is well incorporated with the above ingredients. Sprinkle grated mozzarella cheese on the top, cover with an aluminum foil. Preheat the oven to 350F and bake the pasta for 15 to 20 minutes. Remove the foil and bake for another five minutes, this helps the cheese to melt. Serve with roasted fennel (or any kind of side dish) accompanied with some soft drink or just cold water. I steamed the beans for a minute in the microwave before adding them to the pasta and baking it.I do this because beans generally need more cooking. The fennel bulb is pretty hard in texture. So I prefer cutting them long and thin. Refer the picture for the size. This helps the fennel to cook fast and it also significantly reduces the cooking time. So, it’s very important to cut them thin. In a baking dish, arrange the fennel. Sprinkle salt, pepper, olive oil and parmesan cheese and ½ a tsp of fennel fronds. Mix well, cover with the foil and bake at 350F for about 20 minutes. Remove and check if it needs more cooking. Now add the remaining ½ a tsp of fennel fronds and serve. Roasting the fennel in the oven makes it soft, moist and sweetish in taste. Cook the rice with 2 cups of water. Cut the brinjals 1/2 inch lenght wise. For reference see the picture below. Take a large non-stick skillet put 3 tbsps of oil, few mustard seeds, few curry leaves and then add the brinjal with some salt. 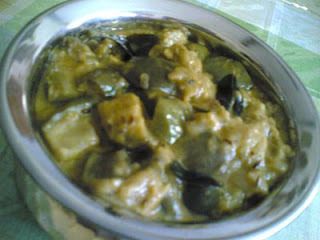 Cook till the brinjal becomes tender. Now add 1/2 tsp salt, 1 tsp vangi bath powder and just cook for a minute and then turn of the stove. 1.Cook the potato in micro wave for good five minutes. Peel the skin, and mash the potatoe leaving just few chunks. 2.In a skillet do the popu by adding 4 tsps of oil, few mustard seeds, 1 tsp chana dal, 1/2 tsp urad dal, a pinch of hing and few curry leaves. 3.Now add the finely chopped green chillies, and onion with some turmeric. 4.Once the onion is soft add the mashed potatoe, salt, lemon juice and salt. 5.Just cook for another five minutes and turn of the stove. 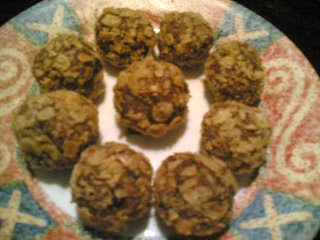 6.When the aloo mixture is warm enough to handle, make small round balls out of it. Mix all the above ingredients with water and hot oil. The consistency should be towards the thicker side. In a skillet add oil , make sure only about sixty percent of the skillet is filled with oil. If there’s too much oil, when you fry the bonda there is a good chance that oil will spill out. Take the aloo balls, dip them in the batter and fry at medium-high heat until golden brown. Serve the aloo bonda with garlic and date chutney. Grind the ingredients labeled from two through five with some water. Wash and peel the mangos in to half inch cubes as shown above. Now add the cubed mangoes with half a teaspoon of salt, half cup of water and let the mango cook for few minutes. When the mango is about seventy percent cooked through add the ground mixture, salt and one cup of water. Let it simmer for another ten minutes till everything comes together. At the end taste and reseason accordingly with some chopped cilantro on the top. Serve this sweet and tangy mango curry with chapathi. • Cut each mushroom to four pieces and keep it on a side. • Now in a skillet add four tsps of oil, cinnamon stick, green chillie and onion. Cook until onion becomes soft, then add the ginger garlic paste and the dry spices (marked 10 through 13). •Cook just for a minute and then add the tomato paste,chopped tomato and half a tsp of salt. Cook for 5 to 7 minutes. •Add the cashew paste with one cup of water and another half teaspoon of salt. Bring it to a boil. •Add the mushrooms, green peas and simmer the curry for ten minutes in med-low heat. •At last taste, re-season it and add the fried tofu with chopped cilantro and some lemon juice. •Let the curry sit for ten minutes before serving, it helps all the ingredients to blend and come together. •Serve the mushroom tofu curry with nan or paratha and some onion and lemon on the side. •First lightly toast the puffed rice for a minute, i do this to make it nice and crisp. • Then take a big bowl, add the puffed rice, few teaspoons of oil and mix well. •Now add salt and the chillie powder. The oil makes the salt and the chillie powder stick to it, without the oil the salt and chillie powder just settles in the bottom. •Add red onion (not too much), tomato, grated carrot, cilantro and freshly squeezed lemon juice. •Taste and reseason accordingly. Serve it, topped with some hot and spicy peanuts. Grind all the above ingredients with some water in a mixer to a smooth paste. 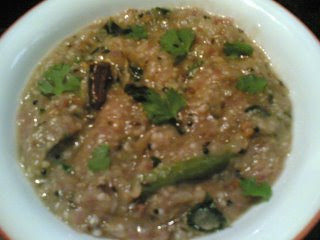 Now do the popu or tadka with ( 1tsp oil, few mustard seeds, few curry leaves and a pinch of hing). Mix this popu into the chutney and serve with dosa or idli. •The black eyed peas have a thinner skin, no presoaking is required before cooking. Pressure cook the black eyed peas, it should be soft but still hold its shape. •Drain the water and squeeze the peas just a little. •Now add finely chopped green bell pepper, onion, garlic, red and black pepper, cilantro and salt. •Mix it well, taste and re-season accordingly. 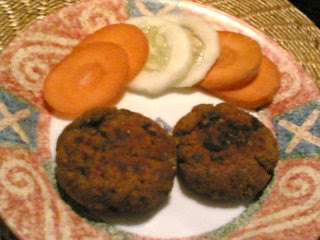 •Now make a pattie, dust both sides of the pattie with all purpose flour(maida). •Take a non stick pan, add few teaspoons of oil and cook the pattie for three minutes on each side. 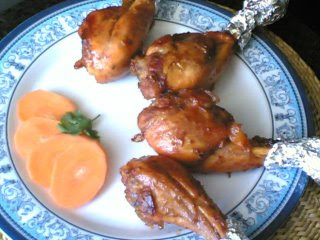 •Serve with some tomato ketchup or maggi hot & sweet tomato sauce. •These cutlets are little soft immediately after cooking. 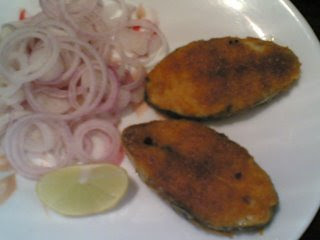 If you prefer it little firm, just leave the cutlets for few minutes and then serve it. • If using a griddle, preheat the griddle to 350 degrees F. A non-stick pan can also be used instead of griddle. •In a medium bowl, combine flour, sugar, baking powder, baking soda and pumpkin spice. •In a small bowl, whisk together the pureed pumpkin, buttermilk, eggs and butter. Pour the ingredients of the small bowl into the ingredients of the medium bowl. Stir to form a smooth batter. •Grease the pan and pour the batter in the form of pan cake and cook each side for about two to three minutes. **Add powdered sugar…will add a nice touch to it! In a skillet add half teaspoon of oil and vermicelli and fry them for about 5 minutes. When the vermicelli is changing color remove and keep it on the side. Now grind one cinnamon stick, cloves and cardamom to fine powder. Now turn the skillet (to med heat) on by putting 4 teaspoons of oil, and then add bay leaves and the other cinnamon stick. After few seconds add the chilies, onion and the ginger garlic paste. Once the onion becomes little soft add the spice powder so that the hot oil brings out the flavor of the spices. Now add all the veggies and ½ teaspoon of salt. Cook the veggies for about 10 minutes. Pour 2 ½ cups of water and cook the veggies in medium heat for about 10 minutes till they become soft. Now add the vermicelli and ½ teaspoon of salt and stir it cooking in a medium low heat for another 10 minutes. Once all the water is absorbed and the vermicelli is cooked threw add chopped cilantro and freshly squeezed lemon juice. You can also fry some cashews in oil and add to the pulav. Mix all the above ingredients and bring to a boil and then bring to medium heat for 2 mts before reducing to low heat until all the water evaporates and the meat and dal is cooked.Stir occassionally to prevent burning. Then add salt and blend in a mixie and knead it like a dough.Shape into round pattis. Flatten the pattis and put a tbsp of the filling in the center and reshape into a patti.Refridgerate for 20-25 mts.Pre-heat a griddle adding 2 tbsps of oil/ghee and shallow fry 3 kebabs at a time.Let them cook on low heat to medium heat.Flip over and brown both sides till golden brown.Serve with salad,onion rings and lemon wedges. Grind all the above ingredients for the sauce to a paste. Heat a pan or wok to smoking hot and then add oil.Add minced ginger and stir fry for a few seconds and let the aroma permeate the kitchen.Now add carrots and stir fry for a minute and then add the cabbage,capsicum and onions.Now stir fry all the vegetables constantly till tender.Dont over cook them.They should be crunchy and crisp and not mushy.Now add the peanut chilli sauce and soya sauce and stir fry till the vegetables are well coated.Add 2-3 tbsps of water and salt, if your find the the sauce is getting stuck to the vessel.Dont fret.Its natural and keep stir frying for a few minutes and then add the cornstarch with the water and let it combine with the vegetables till your get a glazed look to the vegetables.Garnish with scallions and serve hot with any fried rice or noodles. Heat peanut oil to a smoking hot pan or wok and add the carrots and beans and stir fry them for 2 minutes and then add the cabbage, capsicum,green chillis and onions and stir fry on high heat tossing them about till the vegetable get tender.Now add the green peas.Immediately add the cold cooked rice ,salt,white pepper powder and peanut pwd and stir fry for sometime till rice and vegetables are nicely mixed together.Add the vinegar and stir in everything till well mixed and then sprinkle the chopped spring onions and stir it in and serve hot.Remove the green chillis from the rice before serving. Heat oil in a wok or large non-stick skillet till it nearly smokes and add the chopped garlic and ginger and stir fry for a few seconds on high heat.Keep tossing around so that it doesnt burn.Add the red chilli paste and stir fry for 10-15 seconds.Now add sprouts and cover and cook for 2-3 mts on medium heat.Add the soya sauce,tomato sauce,salt and white pepper pwd and mix well.Add the completely cooled rice to the wok and stir fry tossing well for about 2 mts.Its important to note here that after adding the rice, flip the whole thing over as quickly as possible in order to coat the rice grains with the rest of the ingredients. Garnish with bell pepper juliennes or spring onions.Serve hot. Wash chicken and drain water completely.Marinate the chicken with tomato sauce,vinegar,soya sauce,red chilli pwd and pepper pwd for half an hour. Heat a vessel and add the marinated chicken and let the chicken cook in its own juices(dont add water.Cover and cook till the chicken absorbs all the spices and sauces.Keep checking and stirring so that it doesnt burn.Meanwhile heat oil in a pan.When hot add the onions,chillis and garlic-ginger and fry well on high heat stirring continuosly till well browned.Add the fried chicken legs and stir fry for 4-5 mts till well roasted and coated with the onions.Serve hot with salad. Mix all the above ingredients except rice flour and salt and marinate the fish fillets with this mixture and keep aside for 1/2 hr.Dust the marinated fish fillets with the rice flour and salt.Heat 1-2 tbsp oil in a frying pan to medium-high and fry 2 fish fillets at a time for 2-4 minutes each side till golden brown.Pat dry with paper towel when done.Serve hot with salad.Variation:Alternately,you can also dip the marinated fish fillets in all purpose flour,then dip in beaten eggs and then coat in bread crumbs before shallow frying. Heat 3 tbsp oil in a vessel and add the chopped onions and green chillis and fry till transparent.Add the ginger garlic paste and fry till oil seperates. Add all the powders and mix well.Add the tomatoes and stir fried drumstick pieces and cook further for another 3-4 minutes.Add the prawns and stir well till its well coated with the masala.Let it cook for 2 minutes and then add the coconut paste and salt and add 1 cup of water.Cook covered for 5 minutes till you get the desired curry consistency.Turn off heat.Garnish with chopped coriander leaves and serve hot with steamed rice or rotis. Heat oil in a cooking vessel ,add the cumin seeds and let them brown.Now add the garlic,ginger,curry leaves and green chilli and fry for a few seconds taking care not to burn the tempering.Add the chopped onions and saute till the onions turn pink. Add the chopped brinjals and saute them for a few mts.Add the chilli pwd,coriander pwd and turmeric pwd.Combine.Add salt and continue to saute for another 3-4 mts on slow fire covered till the brinjals are almost cooked.Now add the milk and go on stirring on medium heat till milk is completely combined with the brinjals and you attain a thick curry consistency…this could take about 7-8 mts.You need to ensure that the milk doesn’t curdle,so keep stirring till the brinjals are fully cooked in the milk and then turn off fire.Serve with hot steamed rice or rotis. 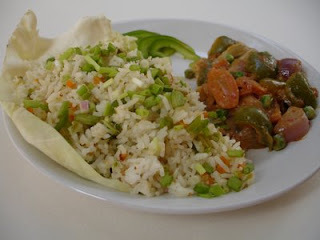 Note:You can make this curry with other brinjal varieties like Thai Eggplants or the purple variety.Ensure that they are tender and offset any bitterness before cooking the brinjals. Add salt, sugar and 1 tbsp of oil to water and bring to a boil.Add the rice flour to it stirring continuously till it forms a thick mixture and turn off heat.Cover and keep aside to cool.Once cool add the vaamu and mix the dough well kneading for 2-3 minutes to form a smooth dough.Make small balls and roll them into (approx 2” )longitudinal shape.Heat oil in a deep frying pan and test the temperature of the oil by dropping a small ball of dough into the oil and if it sinks to the bottom ,it means the oil isn’t hot enough. If the ball springs to the top with bubbles all over,it means that the oil is ready to deep fry the palakayalu.Drop the palakayalu (about 30) gently into the hot oil and keep flipping them over till they are golden brown and crisp.Drain onto absorbent paper and when cool,store the fried palakayalu in airtight containers. Note: Before you start deep frying them,ensure that you shape out the entire dough into longitudinal shapes and keep them covered.Deep fry them batch wise depending on the size of the deep frying pan.Dont add too many at once. Apply oil to the egg plant and place it on the burner and keep turning the brinjal, so that the skin on the surface is uniformly blackened.Place over the burner till the egg plant softens and cooked. (Alternately you can put it on the baking sheet and bake it at 350 degrees C and keep checking it and turning it till the skin starts cracking and can be peeled off without difficulty. Remember, this process has to be done carefully so that the inner part of the egg plant is cooked well).Remove from fire when done and wash the egg plant with water. Peel the skin and mash the egg plant.This is how it looks like after the skin is peeled.Add tamarind paste and salt to the mashed egg plant and keep aside.Heat 1 tbsp oil in a pan.Add mustard seeds and let them splutter.Now add the cumin seeds and black gram dal and let them fry till brown i.e 1 minute approx.Now add the curry leaves and fry for few seconds.Add the chopped onions,ginger and green chillis and fry till transparent.Dont brown it.Now add the mashed egg plant which has been mixed with the tamarind paste and salt.Mix well.Let it cook for 3-4 minutes.Turn off heat and garnish with chopped coriander.Serve with hot rice and ghee or rotis. Grind coriander seeds,cumin seeds and garlic cloves to a fine powder and keep aside. 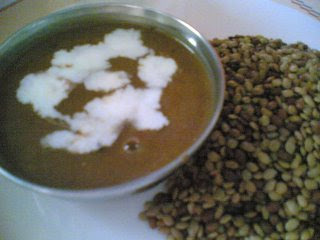 Soak overnight the horsegram (ulavalu) and boil it in 8 cups of water in a fairly large pot.Boil till the dal is well cooked.Generally ulavalu will not have a mushy appearence as compared to other lentils like tur dal.The liquid has a dark brown chocolate color.Strain the liquid and 1/2 cup of cooked dal. The remaining left over dal can be thrown away.Generally its used by farmers as fodder for their cattle. Take 1/2 cup of cooked ulavalu and one cup of the strained ulvallu water and grind it to a paste.Keep aside the ulavalu paste. Heat 2 tbsp oil in a skillet.Add mustard seeds and let them splutter. Now add cumins seeds,whole red chillis and curry leaves and fry for few seconds. Now add the button onions and green chillis and fry for 3 minutes. Add the strained ulavalu water and let it boil.Add salt,jaggery and turmeric pwd. Now add the ground pwd ,ulavllu paste and tamarind paste and let it cook on low heat for 20- 25 minutes stirring occasionally and till you get a thick soup like consistency. Serve hot with rice and a generous amount of fresh homemade butter or cream. Generally the butter is melted and added to the soup and rice,mixed and eaten.Very tasty dish , eaten and relished more during winter times as its supposed to give heat to the body. Bring water to boil in a stainless steel or non-stick pot. Add cardamom and tea leaves and simmer for a minute. 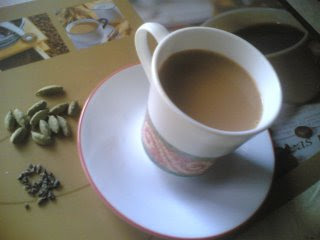 Add milk, sugar and boil till desired colour is obtained.You will know when a lovely aroma is released.Dont boil too much as the tea will impart a bitter flavor.Cover and let it sit for a minute.Strain into cups while piping hot.This serves 2 cups of fragrant cardamom tea. Note:The amount of milk and water can vary according to personal preference. If you want it more milky, increase the quantity of milk and lessen the water and if you want it less milky reduce milk and increase the quantity of water. 1. Heat a little oil, add cumin/mustard seeds. 2. 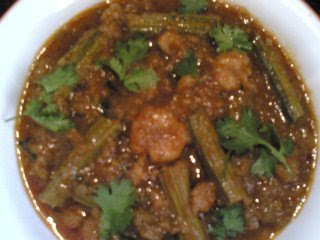 Allow to splutter, add asafetida, curry leaves, ginger. 3. Add onions, stirfry and cook till crisp and brown. 4. Add green chillies, fried bhindi, take off fire. 5. Add all other masala powders, salt, toss very well. 6. Serve hot and crisp with puries, rice or with warmed garlic bread. Add the water to the chopped dates in a pan and slowly cook it over low heat for 6-7 minutes or till the dates get mushy(crush with the spoon).Turn off heat and cool.Dry roast the almonds and pista for 6-7 minutes on medium heat stirring constantly.Cool and grind to a coarse pwd.Powder the biscuits.Keep aside.Mix the biscuit pwd to the dry fruits pwd.Add the cooled cooked dates to this pwd mixture and mix well.Make small balls and roll over crushed corn flakes.Refrigerate for 15-20 minutes.Serve.